I am now releasing the method for Most YT view sellers on the Internet! Alot of Newbies are just starting PPD and CPA, and are still learning about ranking videos on YouTube. Today I am only trying to make it easier AND cheaper for everyone to rank there Videos! I am currently earning around $3,000 monthly... That's not alot, But I run off of only 10 YouTube Videos! I have been doing CPA with AdWorkMedia and I have earned over $8,000 in only 3 Months! These views are VERY good for ranking your videos, so keep on reading and learn more about them! The views you can soon purchase have ranked me first page of all my niches! The site for you to purchase your own views will look exactly like this! Choose exactly How many views you would like! 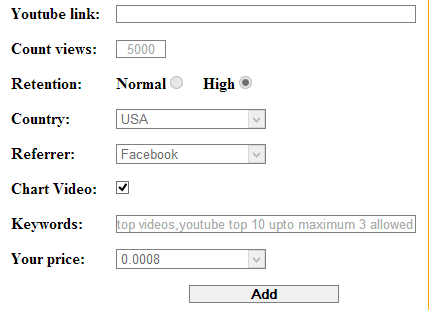 Select if you would like normal, or High Retention views! Choose the Country you would like the views to come from! Choose the Referrer of your Views! Add Keywords you would like to rank for! 3. scroll to pay invoice and your basically done! 5. Go to Add order, Put in your details and submit! Post Here anymore Questions you might have! I will try my best to answer all! 4. Delivery time depends on order. updated my thread, it is now back open! pm with any questions ect. what do you need? his internet was down but he is online now, msg him again. or tell me in a PM what you need help with. Thanks, i will post a review when i have purchased some views. thanks for the vouch, enjoy! Do you accept payza payments? (2013-07-04, 03:43 AM)Apex Wrote: Do you accept payza payments? only paypal at the moment! sorry. Im verry interested but i cant send u a PM. i dont have 10 posts atm. Pls create login data for me! Thank you!